Recently the work in the office is crazy, every thing seems to be "urgent!!!" or "important!" that I have no time to breath let alone think or plan what to write for my blog. So here I am, telling MamaSue that I am having a serious writer's block, nothing comes to mind to give me any suggestions or hint or inspirations. Feeling dejected, I scrolled through my draft posts in my blog to try to get an inspiration and I saw this! 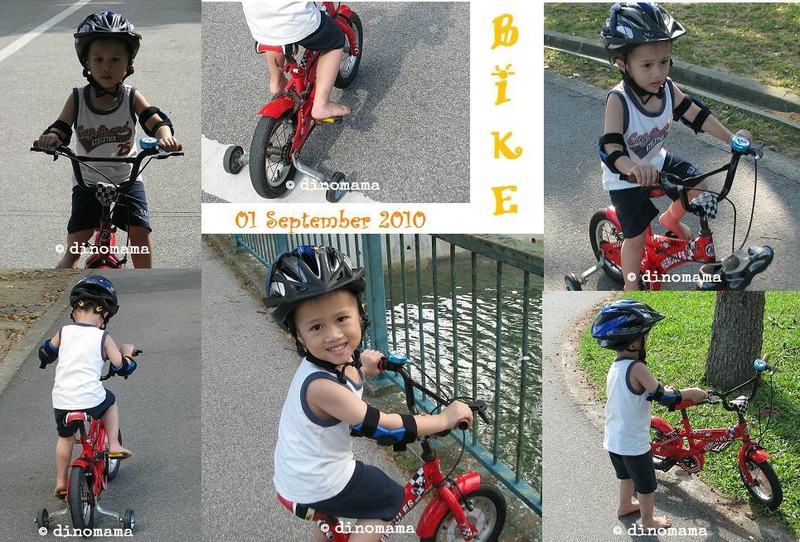 My little boy, riding his first bicycle on 01 September 2010 when he was 4 years old! How did I managed to put this precious memory in "draft" for close to 3 years??? I remembered that day as clearly as it was yesterday, Bro wanted to bring Cousin Megan & Cousin Farn to East Coast Park for some cycling fun and asked us along. Since it was our first time there, we were very excited but part of me were worried as I can't cycle, how am I suppose to watch over him or catch up with him??? Nevertheless, we still went ahead, in full gear too with the helmet and elbow pads given to us by a friend some time ago. Look at DinoBoy's excited and happy face. Initially he couldn't push the paddle hard enough to move the bicycle forward that he got all upset, after a few tries he managed to get the idea and was cruising along slowly. Then his sandals prevented him from having a firm grip on the paddle so I told him to take them off. A mistake... coz after that he paddled with all his might and did not even look back to see where is this mama (who by the way is trying to catch up by walking real fast, no way am I going to run with a heavy bag on my shoulder). My 2nd mistake is not ensuring that he knows how to brake or turn! He was ridding so fast that he lost his balance & fell while maneuvering a curve but thank goodness for the helmet and elbow pads! He had a bad scare (me too!) plus a few minor scrapes, he got up, climbed back onto the bicycle and zoomed away, trying very hard to catch up with his cousins. DinoBoy had a great time that day, he wanted to go back again and kept pestering me. Well, we did go back twice after that and then I never mention anything about cycling to him any more because its really tiring for me to walk and shout for him to slow down or wait for me. Too much work out for me! I secretly hope that he will never learn to cycle because I see many kids in my neighbourhood riding their bicycle in such a dangerous way, ignoring all safety rules and recently there are too many accidents involving cyclists. However, I am afraid that he may miss out some fun when he is older, like what I went through. My friends were riding on the bicycles having fun while I am always the one staying behind looking after their belongings, under the hot sun and feeling bored. *Sigh* Such a dilemma... I shall put this off till as long as possible. NO WAY! These old bones will not stand the falls! Yes you are right, we can't protect him from every so I am going to hold my heart in my throat or hand or where ever and let him learn how to ride a bicycle. The pictures look great. Teaching children about road safety is paramount. As a kid I would spend hours riding my bike, it was great fun. As an adult the thought of riding on a busy road fills me with dread. I'd much rather pack the bike up and head to a place where I can enjoy cycling without the fumes and angry drivers. The only place where we can cycle away from angry drivers are the beaches but there are many angry cyclist too! And then there are the skaters and the people strolling along the cycling tracks. Not every fun if u have to avoid crashing into either of the group of pple. Such a sad thing, unable to enjoy the freedom of zooming on the road feeling the wind in your face and hair. Ya walking is safer and healthier too.